Alexander Iolas, New York, by whom acquired from the artist in February 1962. L. Arnold Weissberger, New York, by whom acquired from the above; his estate sale, Christie's, New York, 17 May 1983, lot 74. Private collection, Pennsylvania, by whom acquired at the above sale; sale, Christie's, New York, 8 May 1991, lot 42. Private collection, New York, by whom acquired at the above sale. Private collection, by whom acquired from the above in 1995; sale, Christie's, London, 3 February 2003, lot 173. Exh. cat., Magritte: an exhibition prepared by the Art Department of the University of St. Thomas, Houston, Texas, Arkansas Art Centre, Little Rock, 1964 (illustrated). H. Torczyner, Magritte, Ideas and Images, New York, 1977, no. 180, p. 112 (illustrated p. 113). Letter from Magritte to André Bosmans, 16 July 1961, in R. Magritte, Lettres à André Bosmans 1958 - 1967, Paris, 1990, p. 178. Letter from Magritte to Harry Torczyner, 6 July 1961, in H. Torczyner, L'ami Magritte: correspondance et souvenirs, Antwerp, 1992, no. D. Sylvester (ed. ), René Magritte, catalogue raisonné: Oil Paintings, Objects and Bronzes 1949 - 1967, vol. III, Antwerp, 1993, no. 932 (illustrated p. 347). New York, Alexander Iolas Gallery, René Magritte: Paintings, Gouaches, Collages 1960, 1961, 1962, April - May 1962, no. 9. Minneapolis, Walker Art Centre, The Vision of René Magritte, September - October 1962, no. 88. London, Tate Gallery, Magritte, February - April 1969, no. 92. Hanover, Kestner Gesellschaft, René Magritte, May - July 1969, no. 68 (illustrated p. 75); this exhibition later travelled to Zurich, Kunsthaus, June - July 1969. New York, Metropolitan Museum of Art, on loan, in July 1991. New York, The Solomon R. Guggenheim Museum, Surrealism: Two Private Eyes, June - September 1999, no. 145 (illustrated p. 209). 'For me it's not a matter of painting 'reality' as though it were readily accessible to me and to others, but of depicting the most ordinary reality in such a way that this immediate reality loses its tame or terrifying character and presents itself with mystery' (Magritte cited in H. Torczyner, Magritte, New York, 1977, p. 203.) Combining two of Magritte's most striking and enduring motifs, the night/day duality of L'empire des lumières (The Empire of Lights) and the leaf/trees of La géante (The Giantess), Les barricades mystérieuses (The Mysterious Barricades), is a haunting work by Magritte. It was painted in July 1961 as part of an important commission that he had received to paint a mural for the Palais des Congrès in Brussels. Merging two of his most striking motifs into one highly evocative image, Magritte also added the figure of the female rider whose presence strengthens the mysterious nocturnal atmosphere of the landscape. This same rider was later to make an appearance in Magritte's last ever painting, the untitled Landscape with Rider of 1967. The predominant atmosphere of Les barricades mystérieuses is essentially the same one as that of L'empire des lumières, the only difference being that here it is leaf/trees that make up the most of the mysterious forest. For Magritte, L'empire des lumières was a favourite theme and one to which he returned repeatedly throughout his career. As he once explained to his friend Harry Torczyner, the concept of the night/day duality was one that held particular appeal for him. 'For me,' he wrote, 'the conception of a picture is an idea of one thing or of several things that can become visible through my painting. It is understood that all ideas are not conceptions for pictures. Obviously, an idea must be sufficiently stimulating for me to undertake to paint faithfully the thing or things I have ideated. The conception of a picture, that is, the idea, is not visible in the picture: an idea cannot be seen with the eyes. What is represented in a picture is what is visible to the eyes, it is the thing or things that must have been ideated. Thus, what is represented in the picture L'empire des lumières are the things I ideated; i.e. a nightime landscape and a sky such as we see during the day. The landscape evokes the night and the sky evokes the day. I find this evocation of night and day is endowed with the power to surprise and enchant us. I call this power: poetry. If I believe this evocation has such poetic power, it is because, among other reasons, I have always felt the greatest interest in night and day, yet without ever having preferred one or the other. This great personal interest in night and day is a feeling of admiration and astonishment' (Magritte, 1956, cited in Torczyner, op. cit., p. 102). The central idea of L'empire des lumières and of this painting is the impossible beauty of the concept that Breton expressed when he exclaimed, 'If only the sun would come out tonight!' 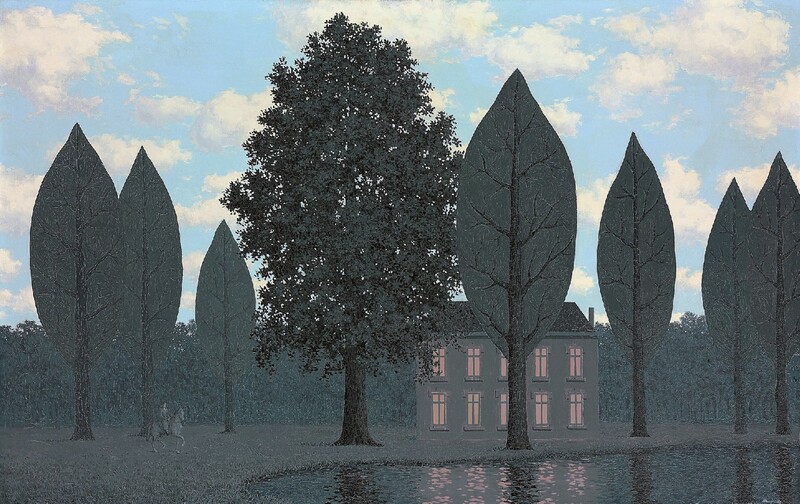 The simplicity of this concept is added to by the organic mystery of the leaf/trees which clearly establish this landscape as being one of an alternate world, a product of Magritte's poetic realm of the visual imagination to which he gave the name Le domaine enchanté (The Enchanted Domain). The rather reassuring presence of a smartly dressed horse and rider trotting peacefully through this enchanted landscape as if they are returning home from their Sunday ride is in keeping with the peaceful twilight atmosphere of the painting even if it does also have something of the Le Jockey perdu (The Lost Jockey) about it. Clearly a more successful reworking of the ideas outlined in his 1957 painting Le concert du matin (The Morning Concert), it is clear that Magritte himself, was evidently well satisfied with the outcome of his work in Les barricades mystérieuses. Not only did he copy it faithfully and without alteration onto the wall of the Halle Delvaux at the Palais des Congrs, but after the mural's completion he hung onto the work and only later included it with a batch of other paintings that he gave to his dealer Alexander Iolas.